“All work and no play, makes Jack a dull boy” goes the saying, The University of Belize held a day for faculty and staff to have fun together at the Belmopan Campus. The day started with a social ride from Mile 31 George Price Highway to the Belmopan Campus. 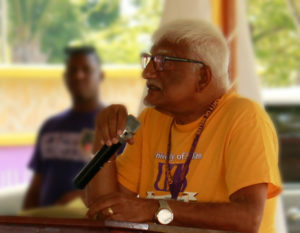 Then there was a brief ceremony where Professor Emeritus Clement Sankat invited all faculty and staff to join the fun and to build UB together, as there was much to be achieved in the exciting times. There were competitions in lime and spoon, futsal, needle and thread, volleyball, and races. There was a special treat where employees could ‘pamper’ themselves with manicure, pedicure, and eyebrow shaping and tinting at special prices. Faculty and Staff were also gifted a special token for their service to UB and the President thanks the Director and Staff of the Human Resource Department for organizing the special event. Good morning and let me welcome all of you to our 2018 Sports Day. I want to especially thank Staff & Faculty who journeyed from Punta Gorda, Belize City and other distant parts to be here with us at the Belmopan Campus today. Let me at the outset say thanks to all our staff who put their best efforts to make this happen - Ms. Hertha Gentle and her Staff of HR, Mr. Francis Burns and his staff of Facilities, Mr. John Salam and his PSOs – all faculty and staff who contributed. We appreciate your efforts, as I salute the efforts of our Faculty & Staff and of course our students, on a great Open/Earth/Multicultural Day yesterday. All of you who work to make the University of Belize do and look good, my sincere thanks to you. Your presence, your commitment and dedication to building the “UB Team” is much appreciated as it is the only way for this University to succeed. “In Unity there is strength –when there is teamwork and collaboration, great things can be achieved”. There is no better way to demonstrate Team Work than through sports and you will experience this yourself today. So let us demonstrate this kind of power, today and every day by putting out our best effort and in unison, and as a Team. That’s why we say “let’s build UB Together”. So have great fun together today through sports; get to know each other and enjoy each other’s company; let us put aside work for this day. The University of Belize through your efforts, Faculty and Staff and Students has begun its great Transformational Leap, Vision 2022. So let us continue this momentum together for progressive change. Buenos días y permítanme darles la bienvenida a todos ustedes a nuestro Día deportivo 2018. Quiero agradecer especialmente al personal docente y administrativo que ha viajado desde Punta Gorda, la ciudad de Belize y otros lugares distantes, para estar hoy aquí con nosotros en el campus de Belmopán. Déjenme, en primer lugar, dar las gracias al equipo que hizo todo lo posible para que esto sucediera: la Sra. Hertha Gentle y personal de la oficina de Recursos Humanos, el Sr. Francis Burns y personal de servicios básicos, el Sr. John Salam y el PSO, todos ellos profesores y personal administrativo que contribuyeron a este acontecimiento. Apreciamos sus esfuerzos, y saludo también los esfuerzos de nuestra planta docente y personal administrativo, así como de nuestros estudiantes, en un gran Día de Puertas Abiertas / Día de la Tierra / Día Multicultural ayer. A todos ustedes, que trabajan para hacer que la Universidad de Belize luzca y opere bien, mis más sinceros agradecimientos. Su presencia, su compromiso y dedicación para construir el “Equipo UB” son muy apreciados ya que es la única forma en que esta Universidad tenga éxito. “En la Unidad está la fuerza: cuando hay trabajo en equipo y colaboración, se pueden lograr grandes cosas”. No hay mejor manera de expresar el trabajo en equipo que a través de los deportes y eso precisamente experimentarán ustedes hoy. Así pues, demostremos este tipo de energía, hoy y siempre, haciendo nuestro mejor esfuerzo y al unísono, como equipo. Es por eso que decimos “construyamos UB juntos”. Diviértanse juntos durante el día de hoy a través de los deportes; conózcanse mejor y disfruten de la compañía de los demás; dejemos de lado el trabajo por hoy. La Universidad de Belize, a través del esfuerzo conjunto de Docentes, Personal Administrativo y Estudiantes, ha comenzado su gran Cambio Transformacional, Visión 2022. Continuemos juntos con este ímpetu, para continuar el cambio progresivo.